When we think of “grace” we typically throw out definitions like “unmerited favor,” “free gift,” and “unearned salvation.” And those concepts are certainly included in the meanings of the Hebrew chen (H2580) and Greek charis (G5485). Both words translated “grace” are about good things we don’t deserve being graciously given to us by God. But we also tend to make assumptions about God’s grace that aren’t necessarily found in scripture. For example, we assume that because the favor is unearned there aren’t any expectations laid on those who accept it. We think because the gift is free it can’t be revoked, rejected, and/or lost. We project cultural and traditional assumptions onto scripture that can cloud the meaning. Several weeks ago, a Messianic Rabbi gave what’s probably the best message I’ve ever heard on grace (click here to listen to it). My goal in this post isn’t to share his entire message, but to narrow-in on one of the points he made that really captured my attention. 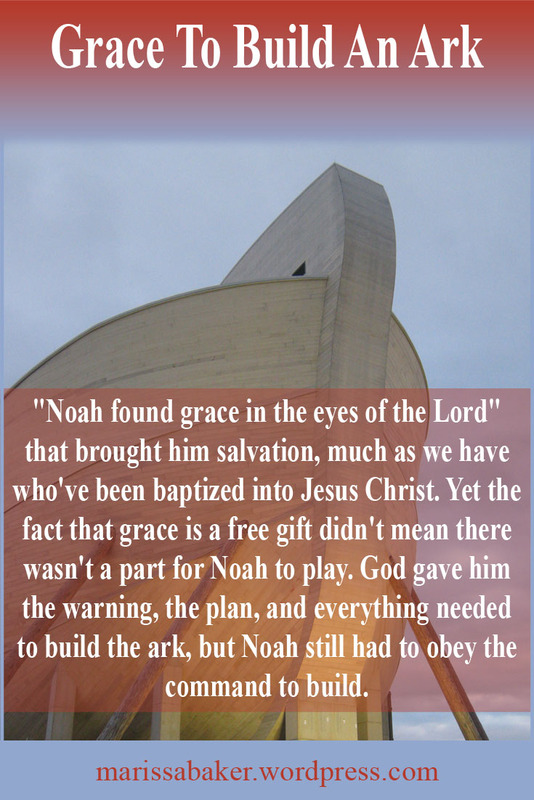 The very first time we see the word “grace” in the Bible is in reference to Noah. At this time, God looks down from heaven and sees “the wickedness of man was great in the earth, and that every intent of the thoughts of his heart was only evil continually” (Gen. 6:5). For that reason, God chose to bring judgement on the earth in the form of a flood. “But Noah found grace in the eyes of the Lord” (Gen. 6:6). It’s a snapshot of what’s going on today and will continue in the near future. As it was back in Noah’s time, our world is now steeped in evil and a day of judgement is approaching (Matt. 24:38-39). Yet God, in His mercy, extends grace to save people from this final judgement (2 Pet. 3:5-10). In his first epistle, Peter describes Noah being saved in the ark as a figure of salvation for New Testament Christians. “It is a copy or an impression of something that has reality, standing instead of the real thing” (Zodhiates, entry G499) — in this case, the ark is “like figure whereunto even baptism doth also now save us … by the resurrection of Jesus Christ” (1 Pet. 3:20-21, KJV). Putting other scriptures together, we know that to receive salvation we must repent and be baptized, which is a type of being buried and raised to new life with Christ (Acts 2:38; Rom. 6:4; Col. 2:12). That’s all part of how God shows “the exceeding riches of His grace in His kindness toward us in Christ Jesus” (Eph. 2:4-10). Once God chose to extend grace to Noah, He warned him of the coming flood and said “Make yourself an ark of gopherwood.” He also gave instructions about how to build it and promised, “I will establish My covenant with you” (Gen. 6:13-21). Noah didn’t earn the right to be in the ark, nor did his family. Their salvation was a gracious choice God made. But notice that something was still expected of Noah. God have him the warning, the plan, and everything needed to build the ark, but Noah still had to obey the command to build. 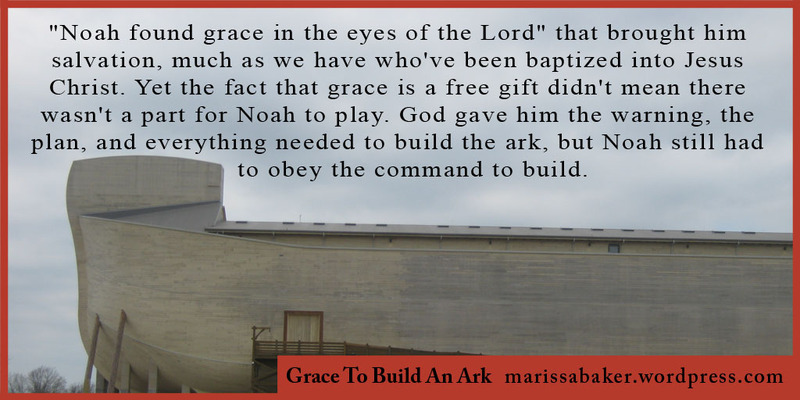 Giving Noah the time and ability to build and ark so he and his family would live and the world would continue — that was a free gift of God’s grace. But Noah wouldn’t have been saved if he’d refused to build the ark. For us, the equivalent is “work out your own salvation with fear and trembling; for it is God who works in you both to will and to do for His good pleasure” (Phil. 2:12-13). We’re expected to act on what God has given us. God’s grace brings us into salvation and then we’re expected to start building and working. Our walk with God doesn’t end when we received His grace. That’s when it starts, and we’re expected to “walk worthy of the calling with which you were called” (Eph. 4:1, see also Col. 1:10; 1 Tim. 2:12). The gift should change us. How could it not affect the way we live our lives to have the Creator of the universe pardon our sins and offer His help in living a life in line with His ways? Though Noah received grace, his salvation also had something to do with how he chose to live his life. Right after the words, “Noah found grace in the eyes of the Lord,” we’re given this description: “Noah was a just man, perfect in his generations. Noah walked with God” (Gen. 6:8-9). Noah stood out from the wicked world around him because he followed God and obeyed when God gave him a command. Noah and his family were the only ones saved because they were the only ones who walked in the Lord’s righteousness. Much as God loves and longs to save the whole world, He won’t force people to follow Him and He won’t bring people into His kingdom who refuse the gift of salvation in word or action. That’s a choice we’re given to make. As He has always done, God sets before us life or death, blessings or cursing. We can either live in His grace or refuse to walk with Him. There’s no third option to walk according to your own heart and ignore God’s Word while still squeaking by into salvation. These are Jesus’ own words, as is the warning a few lines later that only those who do “the will of My Father in heaven” shall know Him and be in His kingdom (Matt. 7:21-23). Salvation isn’t about going on with your old life after you’ve received grace. It’s about a life-changing relationship with the One who continually gives grace (John 1:17; 1 Cor. 1:4; Eph. 4:7; 2 Thes. 2:16-17; 2 Tim. 1:9). As we saw in the post from two weeks ago, love, commandment keeping, and relationship with God are twined so closely together they cannot be separated in a Christian’s walk. And they’re all made possible by God’s grace. It is His freely bestowed favor that brings us into relationship with Him, makes it possible to obey Him, and transforms us to model His character. Grace is powerful. God’s not going to call us into something without equipping us to finish it. That has nothing to do with what we can accomplish on our own. Rather, it’s about believing Jesus when He said, “My grace is sufficient for you, for My strength is made perfect in weakness” (2 Cor. 12:9). By God’s grace, we are saved and we’re equipped to walk by faith, the way Noah did. Wonderful, just so powerful!! So thankful for all these truths. What an encouragement this is. Once again, thank you for teaching and sharing Gods heart with us. I love this! God bless you! !